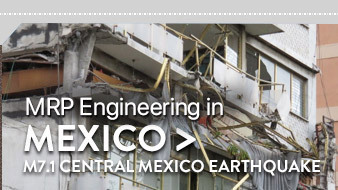 MRP Engineering provides organizations with expert advice in protecting their operations from risks to physical assets resulting from the adverse impacts of extreme events, such as earthquakes. Our philosophy is to listen to your needs, and provide you with practical and cost-effective structural engineering-based risk reduction solutions. The process begins with risk screening and evaluation of critical assets, as described in the following Fact Sheet. STRUCTURAL RISK ANALYSIS for earthquake, severe wind, and other extreme events impacting buildings, equipment, piping, bridges and other structures, and lifelines. STRUCTURAL ENGINEERING DESIGN for selective upgrade or rehabilitation of existing facilities to client's performance expectations. STRUCTURAL DAMAGE INVESTIGATION in support of insurance claims or dispute resolution.